[L] 2009 Hosta of the Year! 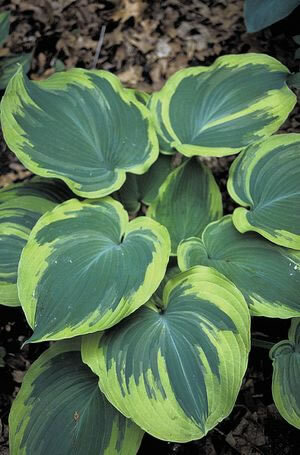 When you add dramatic variegation to an already imposing hosta, you end up with a spectacular plant that commands your attention. Such is the case with Hosta 'Earth angel'. This sport of 'Blue Angel' has large, heart-shaped blue-green leaves with a wide creamy gold border. Forms an immense mound topped with pale lavender flowers in early summer. Check out this Hosta of the Year article for more information about the Hosta of the Year program and all of the past, present, and future selections.